As the victory of Candied Yams earlier in the first round proved, we Southerners love a good sweet “buhtayduh.” As further proof, in this week’s Southern Sweets Showdown bouts, we have two different sweet potato dishes. First up, in the PCD Region (that’s Pies, Cobblers and Dumplings for the uninformed), we see the classic Sweet Potato Pie at #7 bowing up at the #10 Derby Pie. As for Derby pie, this RSM has never had one. As the name implies, the pie hails from Louisville, home of the Kentucky Derby. And we have it on good authority that the pie does not, in fact, contain horse meat from the Derby’s losers … despite any claims we might have previously made to the contrary. So what is a Derby Pie? It began as a signature creation for the Melrose Inn in Prospect, Kentucky. It was created by the restaurant’s manager, George Kern with the help of his parents. Today, his family still runs a business known as Kern’s Kitchen that makes the only “authentic” Derby Pie. What we’ve gleaned is that is contains chocolate chips and walnut pieces, but the rest of the pie – the filling and crust – is the product of a recipe that remains a closely guarded secret. (Okay, maybe there is some horse in there. Why else would they have all this secrecy and subterfuge?) 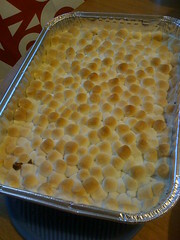 Read more about this delicious looking pie on Kern’s website. Or Google around for recipes that attempt to crack the secret Kern alchemy. In the Cakes, Puddings and Ice Cream region, in a battle of sweets with fancy French names, we have #7 Sweet Potato Souffle facing off with #10 Beignets. 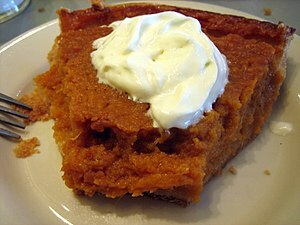 What differentiates a sweet potato souffle from a sweet potato pie, you might ask. (I did.) Well, there’s no crust. And … there’s no crust. Digging a little deeper, I learned that sweet potato souffle is also known as … (drumroll, please) … sweet potato casserole. Apparently some folks thought that “souffle” sounded too high fallutin’. And no good Southerner can stand opposed to a casserole. Here I thought I wasn’t cultured enough to have ever had a sweet potato souffle, but it turns out I’ve made my fair share of them over the years. I did notice that one article pointed out Southern souffles do not contain eggs. I honestly can’t imagine putting eggs in a sweet potato dish, but to each his own … if you’re a Yankee. So whip one up, crumble up some pecans for the topping and, if you have a five-year-old or are a five-year-old at heart, add a generous helping of mini-marshmallows. There you have it. In case you don’t know, the best beignets come from the French Quarter of New Orleans and are best enjoyed with some coffee with chicory, served cafe au lait. For an added bit of adventure, always eat your beignets outdoors … on a windy day … while wearing black. That seems to be the way I always do it. I wear my Southern Sweets proudly.